One of the basic spiritual warfare tactics necessary for living in liberty is to maintain a clean house, spiritually as well as physically. When friends or family come over, they bring dirt and demons. You don’t make value judgments about the dirt they track in or the lint that falls off onto your clean carpet, you just take out your Dirt Devil and vacuum it up. The same is true about the spirit realm. Most of the time, someone who comes into your house with a demon will leave with that demon. But from time to time, there will be left behind what may be termed a “familiar spirit.” A familiar spirit is transferred through familiarity – relational contact with a demonized person – and attaching to some area of spiritual darkness you might provide. Sometimes demons try to remain behind as an act of subterfuge to undermine the peace and tranquility of the home, especially and specifically relationships. We have discovered the presence of a left-behind, not by seeing it, but by our erupting attitudes in the aftermath of a visit by a demonized person. When we travel, we are careful to take authority over the hotel room – since we have a legal contract for its use, it has become our domain. The same thing is true when we stay in someone else’s house – they have given us legal right to stay there, so that room has temporarily become our domain. My house is my domain – so the demons on our guests can be resisted from attack by a word. What’s the word? Here it is . . . NO. How’s that for simple? If you sense them messing with you, speak to the air – you will not disturb me in my domain. I usually use the Gift of Tongues for this operation, whispered, nearly inaudibly, in the presence of my guests. This is the Upside-down Kingdom so everything in here opposes the silly, kingdom of darkness “wisdom” that makes so much sense to our dull minds. Within the Kingdom this one thing is true: The greater the wisdom, the simpler it will be. A couple more things to remember as you take authority over your domicile. First, demons aren’t omnipresent. Hence, if you say something in one room, and the demons are in another room, they can’t hear you and thereby are not compelled to exit. Conversely, demons aren’t deaf. You don’t have to scream like a banshee to get them to go. Speak like a human who isn’t freaked out! In this case, we don’t take the time to name the demons. Just make the general declarations. The cleaning solution within the Kingdom of Light is the Blood of the Lamb. The abiding presence of the Lord is manifest in the oil of the Holy Spirit. Therefore, these are our upside-down weapons. Some folks like to put oil on the doorposts of the home as they begin. If you are into prophetic symbols and pictures, knock yourself out. In any event, the process is as simple as casually walking from one room to another loosing the Blood and the Oil. Your faith is exercised as you move through with no manifestations. It will be quiet and uneventful. You can do it with about the same emotion as you experience while sucking the dirt out of your carpet. Now, there are always those who want to make this complicated. “My husband is not in the Kingdom, so can I clean my house in spite of him?” “We rent, we don’t own. Do we have authority over it?” “Our grown children are really demonized. Should we not let them come over?” Here is the simple answer to all potential concerns: Jesus spent His time with gluttons and drunkards, prostitutes and religious freaks and He stayed clean. You must learn to interact with demonized people without being victimized by them. Find out Who Christ is IN YOU, the hope of glory. Stop reacting like victims! We are kings and priests, anxious for NOTHING! Demons are as much a part of this creation as are we, so the awareness that they are around shouldn’t freak you out. Looking for a demon under every rock is the very definition of angel worship, or, in this case, demon worship. Don’t spend too much time giving them your attention. That’s the definition of worship. Instead, with the knowledge of their presence in hand, focus your attention on the One. Be Sheriff Andy – meek and calm rather than freaking out like Barney Fife. Meekness is simply authority under control. 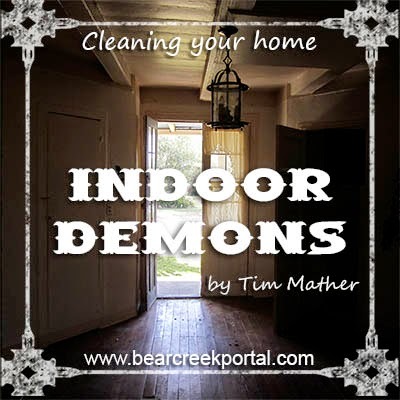 Clean that dirty house, Andy, and invite those indoor demons to go outdoors!